Chiang was born in Port Jefferson, New York. Both of his parents were born in China, and immigrated to Taiwan with their families during the Communist Revolution before immigrating to the United States. He graduated from Brown University with a computer science degree and in 1989 graduated from the Clarion Writers Workshop. As of July 2002[update], he was working as a technical writer in the software industry and resided in Bellevue, Washington, near Seattle. 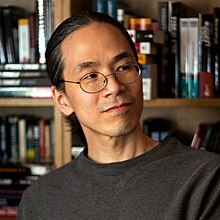 Chiang has published fifteen short stories, novelettes, and novellas as of 2015,[update] and has won numerous science fiction awards for his works: a Nebula Award for "Tower of Babylon" (1990); the John W. Campbell Award for Best New Writer in 1992; a Nebula Award and the Theodore Sturgeon Award for "Story of Your Life" (1998); a Sidewise Award for "Seventy-Two Letters" (2000); a Nebula Award, Locus Award, and Hugo Award for his novelette "Hell Is the Absence of God" (2002); a Nebula and Hugo Award for his novelette "The Merchant and the Alchemist's Gate" (2007); a British Science Fiction Association Award, a Locus Award, and the Hugo Award for Best Short Story for "Exhalation" (2009); and a Hugo Award and Locus Award for his novella "The Lifecycle of Software Objects" (2010). ^ "Ted Chiang". Internet Speculative Fiction Database (Summary Bibliography). Retrieved October 4, 2012. ^ Rothman, Joshua (January 5, 2017). "Ted Chiang's Soulful Science Fiction". The New Yorker. Retrieved January 7, 2017. ^ "An Interview with Ted Chiang". SF Site. July 2002. Retrieved October 4, 2012. ^ "2011 Hugo and Campbell Awards Winners". Locus. Retrieved August 21, 2011. ^ "Chiang". fantasticmetropolis.com. Archived from the original on 2008-04-02. ^ "Exhalation by Ted Chiang". Penguin Random House. ^ "Jeremy Renner Joins Amy Adams in Sci-Fi 'Story of Your Life'". The Hollywood Reporter. 6 March 2015. ^ Zutter, Natalie (August 8, 2016). "Your First Look at Arrival, the Adaptation of Ted Chiang's Novella Story of Your Life". TOR. tor.com. Retrieved 17 August 2016. ^ "Clarion at UC San Diego Graduates and Instructors". Clarion. Archived from the original on 2008-04-27. Retrieved December 9, 2016. Wikimedia Commons has media related to Ted Chiang.